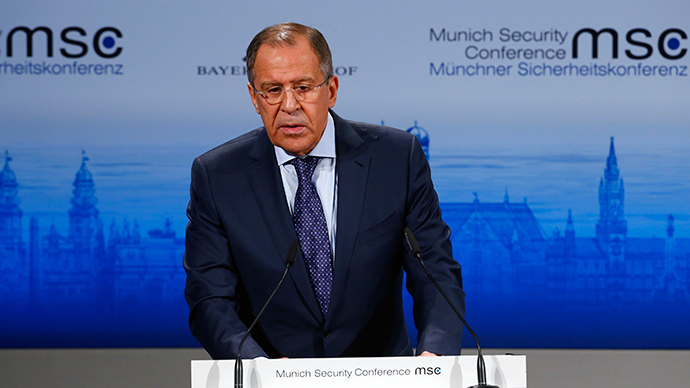 Russia is ready to restore contacts with the NATO, when the alliance itself is ready to do the same, Russian Foreign Minister Sergey Lavrov said before leaving the Munich Security Conference. World leaders gathered in Munich this weekend to discuss the most pressing security issues. During the conference NATO members expressed interest in continuing dialogue with Russia, Lavrov told reporters on Sunday, adding that their interest included military contacts and air space coordination. However, the most pressing topic of the conference was the Ukrainian crisis in the eastern regions, which has escalated since January. Regarding Kiev’s aspirations to join NATO, Lavrov expressed hope that the US-led bloc's ardent support would not do the Ukrainian government a disservice. In 2008, the pro-Western Georgian President Mikhail Saakashvili attempted to take South Ossetia by military force, starting the operation with an attack on Russian peacekeepers. The Russian army had to intervene to repel the Georgian attack and re-establish peace. After the 2008 conflict, Russia and a few other countries recognized Abkhazia and South Ossetia as independent states. "I very much hope, and I said this in my speech at the conference that such reckless support does not blind the current Ukrainian government," he added. The West is starting to see that it’s high time to abandon unsubstantiated accusations and talk of punishment over the Ukraine crisis, and instead look at creating a stable system of European security, said Lavrov. During his many meetings at the Munich conference, Lavrov says: “I felt other moods, as well as understanding that fanning emotions in public, unsubstantiated accusations and calls for punishment are a path to nowhere." Lavrov gave quite a list of contacts who shared that mood naming leaders and ministers from Germany, Italy, Austria, Serbia and Slovenia among them. On Saturday, Ukraine President Petro Poroshenko presented several “Russian passports” thathe alleged were taken from Russian soldiers found on Ukrainian territory. Poroshenko said it was “best evidence” of aggression. However, following a query made by Moscow, Kiev failed to provide copies of the passports, said Russia’s Foreign Ministry as quoted by RIA Novosti on Sunday. “Citing ‘mountains of (Russian) lies and propaganda,’ the Ukrainian president stood on a German stage and, well, lied,” Irish journalist and media commentator Bryan MacDonald told RT. “Russian soldiers cannot use their passports while on active service – they must hand them in. Everybody who has ever lived in Russia knows this. Indeed, even contract soldiers are forced to hand in theirs while on army business and, like the troops, they get a replacement military ID,” he said. Washington has been backing Kiev up in their accusations about the Russian military’s presence in Ukraine, which have been rebuffed by Moscow on numerous occasions. Washington is mulling sending lethal aid to the Ukrainian army currently engaged in a military assault on the eastern Donetsk and Lugansk regions. US Secretary John Kerry said on Thursday while visiting Kiev that President Barack Obama’s administration will decide on issue next week. The divide between the EU and US in their policy towards Ukraine has been increasing of late, Marcus Papadopoulos, publisher and editor of Politics First UK magazine, told RT. Papadopoulos believes that the long-term solution to the crisis would lie in Washington’s decision to abandon the objective of trying to bring Ukraine into the West’s orbit and into NATO.